This statistic shows the preferred social networks of U.S. teenagers. During the fall 2018 survey, it was found that Snapchat was the most important social network for 46 percent of U.S. teens. Facebook was ranked fourth with six percent of teenagers in the United States stating it to be their favourite. It is no secret that the young really know what’s what when it comes to new technologies these days. Especially those born in the internet era and who only know of analog telephones and cameras from stories of their elders seem to be constantly online and always following the latest tech trends. In fact, a recent survey shows that some 92 percent of American teens accessed the internet on a daily basis, where 56 claim to connect several times a day, and 24 percent are connected almost constantly to the internet. Furthermore, the move from desktop computers to mobile devices insured that teenagers would be some of the most fervent users of mobile internet, anytime, anywhere. As of 2015, an estimated 89 percent of 13 to 14 year-olds and 93 percent of 15 to 17 year-olds have mobile access to the internet through a phone, tablet or other device. When it comes to social media too, teenagers spend a lot of daily time interacting with friends and family, posting statuses, pictures, music and videos or playing games. Many have profiles on different platforms for different purposes and flexibly use specific feature according to their needs. 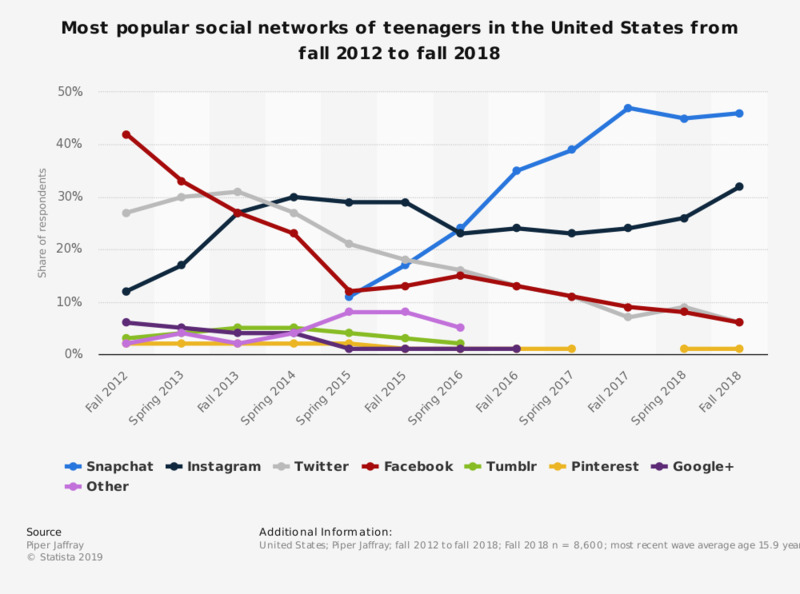 Facebook, the largest social network in the world with over 1.5 billion active users as of March 2015, is also the most used among over 40 percent of American teenagers. Although Instagram is shown to be the second most used social network among this age group, the photo-sharing platform has grown significantly in the past few years in terms of how much teenagers like to use it. The number of Instagram users in the United States aged 12 to 17 is projected to grow from 13.6 million in 2014 to almost 19 million in 2018. Values may not add up to 100 percent due to rounding. The source does not provide exact data regarding the age of respondents. No Fall 2014 data regarding the survey question.